[New York, NY – November 2, 2018] Today, H.E.R. releases I Used To Know Her: Part 2, an 8-track, digital only EP, and the follow up to her I Used To Know Her: The Prelude EP, which debuted at #1 on the Billboard R&B Albums chart. The new EP examines the perils and pleasures of relationships and coming of age in today’s society. Click here to listen. The mysterious singer/songwriter/musician reveals a bit more of herself with the premiere of the alluring “Could’ve Been” video featuring Bryson Tiller. Shot over the course of 2 nights in Miami, the beautifully shot video, directed by Lacey Duke (Janelle Monáe, Dram, Netflix’s Strong Black Lead spot), shows the characters musing over what could have been, matching the contemplative sentiment contained in the collaborative ballad from The Prelude EP. Click here to watch. 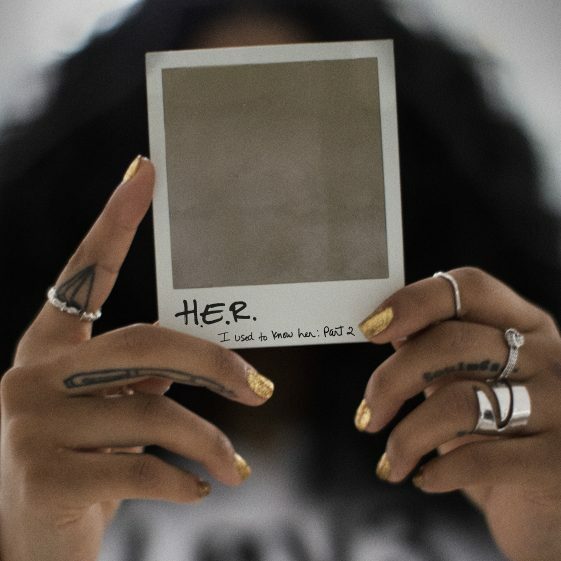 Earlier this week, Apple Music announced H.E.R. as the latest “Up Next” artist to be featured within the video and music streaming service’s monthly program geared towards identifying and showcasing rising talent. The singer and multi-instrumentalist is currently the #6 R&B artist worldwide across Apple Music and has been a mainstay on The A-List: R&B playlist and Beats 1 Radio since September 2016. On November 6, Apple Music will feature a ‘Up Next with H.E.R.’ short film that will give fans a behind-the-scenes look at the fascinating R&B artist’s career, musical background and process—in her own words and from those who work with her most closely. H.E.R. also has the distinct honor of being the most nominated artist for the 2018 Soul Train Awards with 7 nominations, including Best R&B/Soul Female Artist, Song of the Year (“Every Kind of Way”), Album/Mixtape of the Year (H.E.R. ), Best Collaboration Performance (“Best Part” w/Daniel Caesar), Video of the Year (“Avenue”) and two Ashford and Simpson Songwriter’s Awards (“Focus,” “Best Part” w/Daniel Caesar). The 2018 Soul Train Awards will air on November 25 at 8pm ET on BET. She will kick off her second headlining North American tour on November 10th in Atlanta. The “I Used to Know HER” tour will make stops in a number of major cities including New York, Chicago, San Francisco and more. Bri Steves and Tone Stith will join the tour as the opening acts. See full tour routing below.